Page 21 of 41 for Digital Forensic Science | Tutorials and research about digital forensic science and information security. The overall goal of this challenge is to raise the state of the art in digital forensic practice by providing an open public venue for a best-of-breed competition. We challenge contestants to demonstrate effective methods and to develop open source tools for analyzing mobile malware. The winner will be announced in August at the DFRWS USA 2014 conference in Denver, CO.
Contestants are encouraged to select malware samples that are interesting from a forensic analysis perspective, and that exhibit many of the challenges presented by mobile malware. Mobile malware samples can be obtained from various sources from various sources for their analysis, including http://www.malgenomeproject.org, virusshare.com, and http://contagiodump.blogspot.com. Alternately send mail to mobilemalware+subscribegooglegroups(d0t)com. Submissions will be grouped into two categories to encourage both practitioners and researchers/developers to participate. Practitioners: Forensic analysis of mobile malware using existing best-of-breed methods and supporting tools. These submissions must include the malware samples that were analyzed, and documentation detailing all methods, tools and findings. Researchers/Developers: Creation of new techniques and tools for analyzing mobile malware. When submitting your entry to this challenge, please indicate which category you would prefer. Each team can submit only one entry, either as practitioners or researchers/developers (not both). Don’t forget about the 6th International Conference on Digital Forensics & Cyber Crime, September 18–20, 2014 in New Haven, Connecticut, United States. </div><div>The command should output the OpenSSL version number. 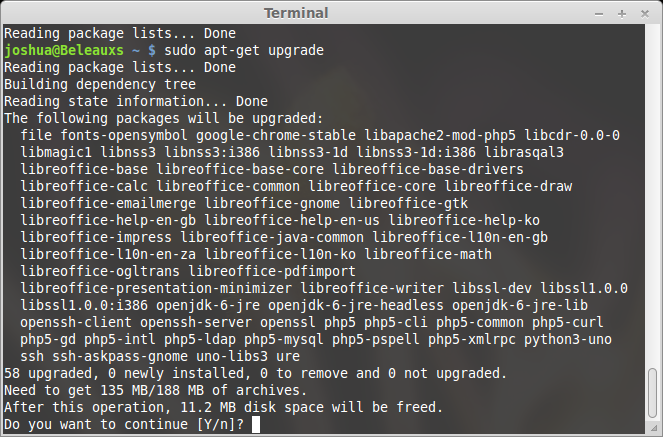 </div><div>If you are on Ubuntu, you should also look at the “built on” date. If the date is on or after April 7th, then the patch has been applied. If the date is before April 7th, do a dist-upgrade to update. <table align="center" cellpadding="0" cellspacing="0" class="tr-caption-container" style="margin-left: auto; margin-right: auto; text-align: center;"><tbody><tr><td style="text-align: center;"> </td></tr><tr><td class="tr-caption" style="text-align: center;">Apt-get upgrade will likely want to upgrade a number of packages, many of which are potentially vulnerable to the attack.</td></tr></tbody></table>Once the upgrade is complete, the “built on” date should be on or after April 7th. <table align="center" cellpadding="0" cellspacing="0" class="tr-caption-container" style="margin-left: auto; margin-right: auto; text-align: center;"><tbody><tr><td style="text-align: center;"> </td></tr><tr><td class="tr-caption" style="text-align: center;">Patched OpenSSL installation on Ubuntu. Note, the version is still 1.0.1e - make sure to check the build date.</td></tr></tbody></table>Make sure you reboot your system to make sure the changes are applied. The ‘Indicators of Anti-Forensics’ (IoAF) project is an effort towards automated anti-forensic trace detection using signature-based methods. Each “version” represents the work of different KITRI Best of the Best groups to advance the idea. From two groups working on the same project, a number of similar tools have been created. I’ve forked the main modules that can be found under IoAF at github. Please feel free to contribute or even fork the projects. We are continuing the project this summer, so hopefully cleaner, consolidated code will be available. <table cellpadding="0" cellspacing="0" class="tr-caption-container" style="float: right; margin-left: 1em; text-align: right;"><tbody><tr><td style="text-align: center;"> </td></tr><tr><td class="tr-caption" style="text-align: center;">eForensics Magazine: Anti Forensics Techniques</td></tr></tbody></table>While the first IoAF group is working on a paper for Digital Investigation, the second group decided to write an article about A general approach to anti-forensic activity detection. This article gives a pretty good literature review about some of the work done in general anti-forensic detection, then shows the investigators how to determine traces created by anti-forensic programs. The work is somewhat similar to the work of Geiger on ‘counter forensics’, but - I believe - the proposed method is easier for investigators to implement or even automate. Their article can be found in eForensics Magazine Vol. 3 No. 5. </div>While the developed tools are currently available on github, the next few months will see them refined. Stay tuned!